Blockbuster’s head of digital strategy believes his ailing company is better positioned than any company out there. Blockbuster is struggling. The Dallas-based rental chain owes close to $1 billion, and has repeatedly warned it might face liquidation if it can’t find new debt financing. Shares are now trading at 11 cents, and the company has been forced to delist from the New York Stock Exchange. It recently reported a higher than expected 20% drop in quarterly revenue, and it’s already missed deadlines for interest payments. Chapter 11 bankruptcy and Chapter 7 liquidation are on the table. With so much headwind, what is the rental giant doing to survive in the digital age? 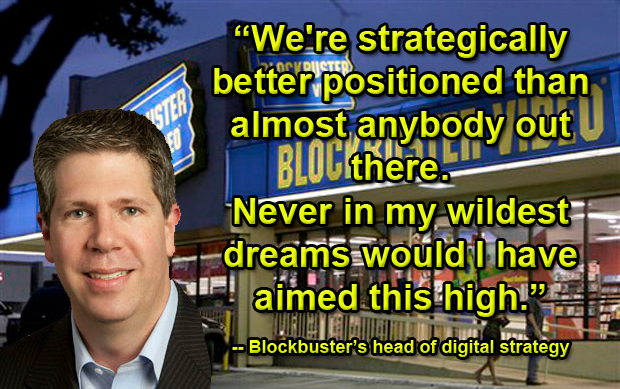 We spoke with Kevin Lewis, head of Blockbuster’s digital strategy, to find out. In part one of our interview, Lewis spoke about competitors Netflix and Apple. Today, he talks candidly about Blockbuster’s financial future and the potential of its first foray into the app market. Fast Company: Blockbuster CEO Jim Keyes told me that the company’s fight back to success is a marathon, not a sprint. Do you think the company has enough time for this long-term vision? Kevin Lewis: It’s no surprise that Blockbuster has a slightly challenged financial picture. But Blockbuster has a long and attractive future, who knows in what form. This is a powerful brand worldwide. Could things have gone faster or better? You can always say I wish I did X and not Y. But if you asked me in 2009 whether we’d be the only one in the mobile space selling movies other than Apple and whether we’d have Blockbuster On Demand–never in my wildest dreams would I have aimed this high. To be clear, we have a long way to go. But I’m really proud of what we’ve accomplished, and at the end of the day, we’re strategically better positioned than almost anybody out there. Blockbuster’s new app comes default on the Droid X. How did that deal happen? You’ll notice there’s no Netflix on there. We are the movie provider for these devices. We’re in it for the movies. We’re not trying to get in the hardware business or sell you a different subscription–what we we want to give you is a really compelling movie service. By the way, my biggest competitors in this space are not Amazon, Apple, and Netflix. My biggest competitor is: What the heck is this thing, and how does it work? When you have a Blockbuster-branded application, there’s a certain assumption about what it does. As much as I would love to say that we’re a set of brilliant people who know exactly what we’re doing all the time, the reality is that the the brand is an incredibly powerful element in solving that problem. Part of it is doing what we know. For device manufacturers, saying that we’re going to help you serve your customers better, well, that’s pretty compelling for them. Currently, you can only download–not stream–movies through the Blockbuster app, and only over Wi-Fi. Why not create a streaming app? And will consumers be able to download movies over 3G ever? There’s a trade-off. The files are pretty darn big, and can go as large as 500 megabytes. As 3G speeds get faster, there is a significant likelihood that it could be downloaded over the networks. We believe a download solution is critically important in mobile devices. What happens on, say, the subway? Are you going to accept: Oh, I’m sorry, you’re signal is weak–sorry, you’re only 75% through downloading but can’t play? When I download movies on the Droid app, can I sync them to my computer? Can I watch them on my TV? You’re asking, How come I can’t do HDMI out? [Ed. note: HDMI output allows you to transmit digital audio and video to different devices.] Let me give you the answer. If we didn’t care about movies, we would’ve enabled HDMI out. Why? Consider the file that’s optimized for the Droid device. Now think about that file on a 65-inch plasma TV. It’s a fundamentally different file. If I give you HDMI out, sure, you can watch a movie on your TV. But you’d be disappointed with the picture quality. There’s a lot of things I can do to fix that. I could turn that phone into a streaming device, or give you a larger file size. Watching grainy video from a file optimized for a 4.3 inch device on a 65-inch plasma doesn’t feel like the right thing to do. We’re actually engaged deeply with our user community on this one. Isn’t that the problem with a download solution? With Netflix’s streaming service, I can watch it on my laptop, or my iPad, or my Wii, and it’s all synced to the same location. You could also just go to Blockbuster.com, get the PC application, and download the file in the same way. We have that functionality. The question is, How do you implement it and how do you communicate it to customers? For the average consumer–and it’s not that the average consumer is stupid–they’ve actually have been really clear about their preferences, which are: That’s not a whole lot of fun. You have to make that seamless. One of the ways you’re trying to make it seamless is by replacing the “Download” button with a “Get It” button. Why? We developed a “Get It” button. The “Get It” button says: Look, we’re Blockbuster, we have every movie ever made. Our job is to “Get It” to you. Blockbuster is a brick-and-mortar business. As the head of the company’s digital strategy, how do you reconcile that with your vision of the future? Obviously in the long-term, it will all be digital. The question is, when? The migration from VHS to DVD has happened. Moving to fully digital will take a hell of a long time–a lot longer than the most bullish digital folks believe. I believe there will be a hybrid of physical and digital for some time.